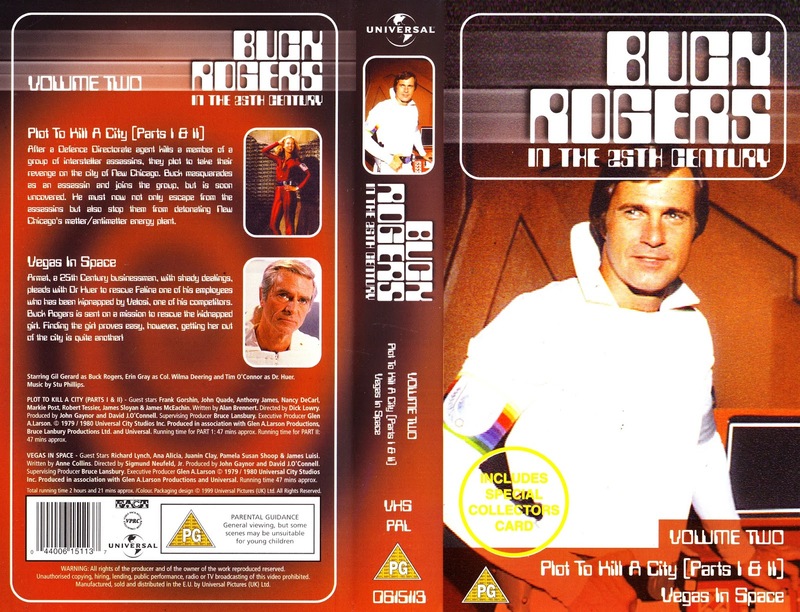 From the VHS: More BUCK ROGERS IN THE 25TH CENTURY tape-based goodness: the second sell-through release with another two-parter (THE PLOT TO KILL A CITY) and a prime example of one of the show's one hour outings: the glitzy very Seventies studio-bound VEGAS IN SPACE. It was the latter that opened the BBC TWO repeat run back in the Eighties because they didn't (yet) have the rights to Buck's opening night. The episodes weren't being released in any particular order (except for the pilot appearing first on the first tape) so it's surprising Universal passed on the chance to include UNCHAINED WOMEN (featuring an after-she-was-famous guest turn - to get her out of her Universal contract - by Jamie Lee Curtis) or the near legendary SPACE VAMPIRE. Maybe both were earmarked for future tapes. But, as far as I know, the line was abandoned after the original two tapes and the only subsequent release was part of the SCI-FI CHANNEL tie-in. The two volumes were released together and - if you purchased both - you got a bonus tape (in a card slipcase) of the movie version of the pilot. Slow, just wondering if you were planning to continue your regular posts on Empire Strikes Back monthly ? btw your earlier post on AMERICAN GOTHIC reminded me of some of Gary Cole's other parts including those in FATAL VISION, MIDNIGHT CALLER and the ill-fated Babylon 5 spin-off CRUSADE.